Eugene Debs & the American Movement is an educational video that documents fifty years of long-suppressed history. Using extensively researched photographs, drawings and newsreel footage, it tells a story of the bloody strikes and brutal government reaction to the American workers' attempts to organize. This film is movingly narrated in Deb's own words, read from his speeches and writings, by his friend and comrade, Shubert Sebree. Debs and the movement he helped build are more than just nostalgia, they are roots of a long and bloody struggle of American working people to own collectively what they produce. 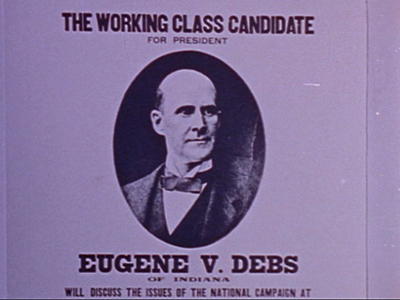 What they say about "Eugene Debs and the American Movement"
"It's quite a challenge to piece together an audiovisual presentation of a period that preceded the audiovisual age ...happily this film does so in a manner that is both emotional and educational."